Our cups are made from buffalo horn, polished and fitted with a wooden bottom. The horn handle has been securely epoxied to the cup. 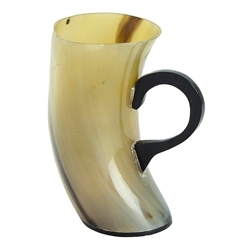 These horn cups are light-weight and handmade. Please note: Due to the organic nature of this product, no two will ever be alike.